I’d guess the Japanese were even worse off with regard to high octane fuels than the Germans were. Although they had access to a considerable supply of high grade crude (at least until US submarines cut the shipping lines) I don’t believe they had sufficient processing capability to take full advantage of it. Engine: Nakajima Ha.45: 1970hp/S.L. 1695hp/21,000ft. Armament: 4x20mm. Range: 1795mls/156mph/359gallons of fuel. Performance at the test weight of 7940lbs. : Climb: 3780fpm/S.L. 3290fpm/21,000ft. 10,000ft/2.7min. 20,000ft/5.8min. Service Ceiling: 39,000ft. Maximum Speed: 348mph/S.L. 422mph/21,000ft. Due to all the problems it encountered in production, but taking into account the ingenuity of some chief mechanics in the field, IMHO it was likely the Ki.84 the Allied pilot would meet in combat would be capable of 325-350mph/S.L. and 384-425mph/20,000ft. Just an opinion though. I have read that the performance of the Ki.84 varied greatly in the field during 1945. The Ki.84 is the most controversial Japanese fighter to evolve from WW2. It definitely had the potential to be a world beating contender if it hadn’t been for its constant failure of exhaust stacks due to poor materials, inefficient welding and problems with the hydraulics. According to Wright Field Report No. F-1IM-1119B-ND released in January 1947, a Ki.84-1 with the Ha.45 Model 21 engine, Serial No. 302, performance was found to be as follows: Speed: 350mph/S.L. 389/10,000ft. 412/20,000ft. 426/23,000ft. 400/30,000ft. 370/35,000ft. This was listed under Normal Fighter, Military Power. Climb Normal Fighter: 3790fpm/S.L. and 3195fpm/20,900ft under Military Power. 3615fpm/17,900ft under W.E.P. Service Ceiling: 38,800ft. No test weight or engine power settings given. On another official PERFORMANCE AND CHARACTORISTIC sheet 156A-2 the following performance is listed: Engine at T.O. and WEP: 1970hp/S.L. 2040hp/3000ft. 1850hp/17,900ft. The following performance is at 7,940lbs. : Speed: 369mph/S.L. 427mph/20,000ft. Climb: 4275fpm/S.L. 3615fpm/17,900ft. Maximum Range: 1,815mls/173mph/1500ft./359gallons of fuel. These test figures are under ideal situations and using USA high grade fuel. However, quoting Richard Dunn: “I have a copy of a translation of a captured document of unknown reliability which indicates two maximum speeds for the Ki.84-1 (light) and Ki.84-1 (improved versions). The two speeds apparently relate to the Ha 45 rating of 2000hp at 4,020ft and 1800hp. at 19,680ft: Ki.84-1 (light): 412mph and 430mph respectively. Ki.84-1 (improved): 409mph and 427mph respectively. The light version is listed at 7885lbs. and the improved is listed at 8507lbs. Ever since the Frank and Mustang first met in China the dogfights that ensued were reputed to be among the most ferocious of WW2! The Ki 84 potentially had everything a balanced air superiority fighter needed except reliability. It was fast, far ranging, light on its feet, fast climbing, armored and hard hitting, and in strong numbers. Only lacking high altitude performance to the degree of the USAAF or RAF. However it had the agility to turn inside all of them. It’s like a Bf 109K or Yak-3 but with long range. Terminal dive was good at 495 mph. Initial climb was in the 4,000ft/min class and level speed was better than any mass produced fighter from Japan at 427 mph (with high octane fuel). But as the war was ending, factory quality was fading – even muzzle velocity of its fast (850 rpm unsynchronized!) world beating 20mm cannons decreased. Performance (early production): Maximum speed 392 mph at 20,080 feet, cruising speed 277 mph. An altitude of 16,405 feet could be reached in 5 minutes 54 seconds. An altitude of 26,240 feet could be attained in 11 minutes 40 seconds. Service ceiling 34,450 feet. Normal range 1053 miles, maximum range 1347 miles. Weights: 5864 pounds empty, 7955 pounds loaded, 8576 pounds maximum. Dimensions: Wingspan 36 feet 10 7/16 inches, length 32 feet 6 9/16 inches, height 11 feet 1 1/4 inches, wing area 226.04 square feet. Armament: Two fuselage mounted 12.7-mm Type 1 (Ho-103) machine guns and two wing-mounted 20-mm Ho-5 cannon (Ki-84-Ia). Two fuselage-mounted 20-mm Ho-5 cannon and two wing-mounted 20-mm Ho-5 cannon (Ki-84-Ib). Two fuselage-mounted 20-mm Ho-5 cannon and two wing-mounted 30-mm Ho-105 cannon (Ki-84-Ic). External stores included two 551-pound bombs or two 44-Imp gall drop tanks. The Ki-84-II or Hayate Kai was an attempt to conserve valuable supplies of aluminum by employing large numbers of wooden components in the manufacture of the Hayate. The rear fuselage, certain fittings, and modified wingtips were made of wood, with all the wood work being carried out at a shadow factory at Tanuma. The engine was the Nakajama [Ha-45] 21, 25 or 23 with low-pressure fuel injection. Armament consisted of four 20-mm or two 20-mm and two 30-mm cannon. 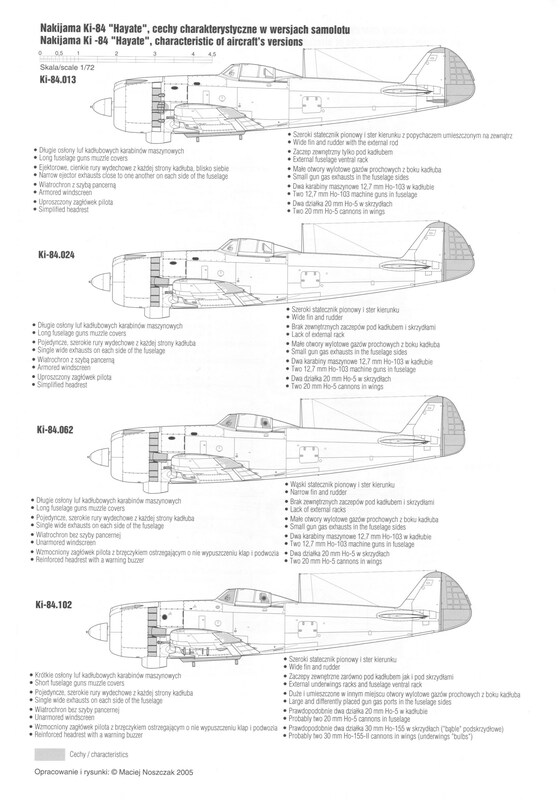 The designation Ki-84-II was actually a Nakajima designation, the aircraft in JAAF service retaining the Ki-84-Ib or -Ic designation, depending on armament. Engine: One Army Type 4 eighteen-cylinder air-cooled radial (Nakajima Ha-45). The following engine models were used: [Ha-45]21 rated at 1990 hp for takeoff and 1850 hp at 5740 feet. [Ha-45]23 rated at 1900 hp for takeoff and 1670 hp at 4725 feet. [Ha-45]25 rated at 2000 hp for takeoff and 1700 hp at 19,685 feet. Dimensions: Wingspan 36 feet 10 7/16 inches, length 32 feet 6 9/16 inches, height 11 feet 1 1/4 inches, wing area 226.04 square feet. Armament: Two fuselage-mounted 20-mm Ho-5 cannon and two wing-mounted 20-mm Ho-5 cannon. Alternatively, the two wing-mounted 20-mm Ho-5 cannon could be replaced by two 30-mm Ho-105 cannon. External stores included two 551-pound bombs or two 44-Imp gall drop tanks. The Ki-84-III was a high-altitude version of the Hayate powered by a Ha-45 Ru engine with a turbosupercharger in the fuselage belly. This version was still on the drawing board when the war ended. The Ki-106 was an all-wood version of the Ki-84 Hayate designed by Tachikawa Hikoki K.K., with the goal of achieving further savings of aluminium. Three airframes were built for Tachikawa by Ohji Koku K.K. (Prince Aircraft Co, Ltd) at Ebetsu, in Ishikari Prefecture on Hokkaido. The use of wood made it possible to employ lots of unskilled labour in the manufacture of the airframe. The Ki-106 was powered by a 1990 hp Nakajima [Ha-45] 21. The Ki-106 retained the external configuration of the Hayate, but the vertical surfaces had increased area and the skin was of plywood with a thick lacquer coating. The armament was four 20-mm cannon on the first Ki-106, but was reduced to only two cannon on the second and third prototypes to save weight. Flight tests started in July of 1945. The use of wood rather than metal had raised the normal loaded weight to 8958 pounds (an increase of some 600 pounds), and this had an adverse effect on climb rate and manoeuvrability. An altitude of 26,240 feet could be attained in 13 minutes 5 seconds, this being nearly a minute and a half greater than that for the standard Hayate. However, because of the aircraft’s exceptionally fine finish, the maximum speed of 384 mph at 24,000 feet compared closely to that of the standard metal Hayate. During trials with the first prototype, the plywood skinning failed during a test flight and began to rip away. The aircraft managed to land safely, and steps were taken in order to anchor the skin more firmly to the airframe. Although the flight tests were quite satisfactory, the end of the war brought the Ki-106 project to an abrupt halt. Engine: One Army Type 4 eighteen-cylinder air-cooled radial (Nakajima Ha-45/21) rated at 1990 hp for takeoff and 1850 hp at 5740 feet. Performance: Maximum speed 385 mph at 21,080 feet. Cruising speed 310 mph at 20,100 feet. An altitude of 16,405 feet could be reached in 5 minutes. Service ceiling 36,090 feet. Normal range 497 miles plus 1.5 hours of combat. Weights: 6499 pounds empty, 8598 pounds loaded. Dimensions: Wingspan 36 feet 10 7/16 inches, length 32 feet 7 3/4 inches, height 11 feet 9 5/16inches, wing area 226.04 square feet. Armament: Two fuselage-mounted 20-mm Ho-5 cannon and two wing-mounted 20-mm Ho-5 cannon. External stores included two 551-pound bombs or two 44-Imp gall drop tanks. 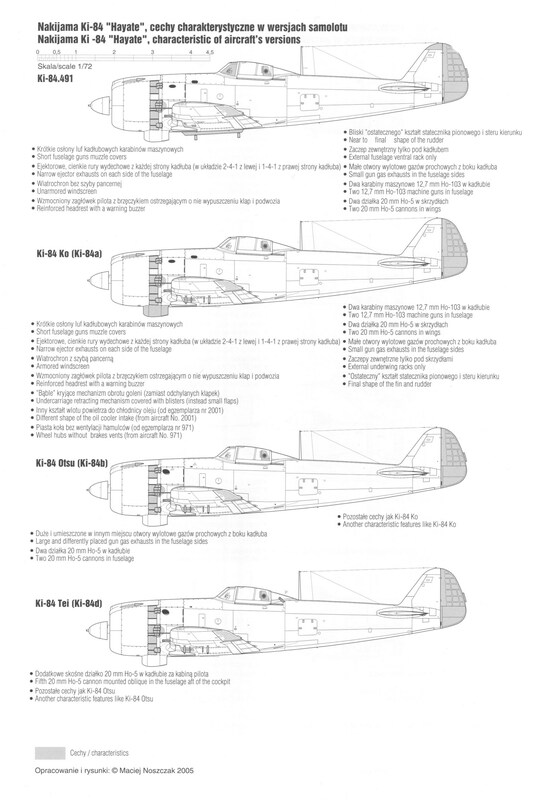 The Ki-113 was a version of the Ki-84-Ib partially built of steel. It was an attempt to conserve light alloys by using steel in place of aluminium in as many sub-assemblies as possible. It employed steel sheet skinning and the cockpit section, ribs, and bulkheads were made of carbon steel. The aircraft retained the Ha-45 Model 21 engine and had an armament of four 20-mm cannon. The Ki-113 was designed in the autumn of 1944, and a single example was completed in early 1945. However, it never flew since it was decidedly overweight. Engine: One Army Type 4 eighteen-cylinder air-cooled radial (Nakajima Ha-45/21) rated at 1990 hp for takeoff and 1850 hp at 5740 feet. Performance (estimated): Maximum speed 385 mph at 21,325 feet. An altitude of 16,405 feet could be reached in 6 minutes 54 seconds. 33,800 feet service ceiling. Normal range 621 miles plus 1.5 hours combat. Weights: 6349 pounds empty, 8708 pounds loaded. Dimensions: 36 feet 10 7/16 inches, length 32 feet 6 9/16 inches, height 11 feet 1 1/4 inches, wing area 226.04 square feet. Armament: Two fuselage-mounted 20-mm Ho-5 cannon and two wing-mounted 20-mm Ho-5 cannon (Ki-84-Ib). External stores included two 551-pound bombs or two 44-Imp gall drop tanks. No effort on the part of Najajima seemed to succeed in turning the Ha-45 engine into a truly reliable powerplant, so the JAAF began to look for other sources of engines for the Hayate. In view of the successful adaptation of the Kawasaki Ki-61-II Hien airframe to take the Mitsubishi Ha-112-II air-cooled radial engine, the JAAF thought that the Ha-45 engine problems might be solved by replacing this engine with the Mitsubishi Ha-112 in the Ki-84. The designation Ki-116 was applied to the fourth Mansyu-built Ki-84-I adapted to take a 1500-hp Mitsubishi [Ha-33] 62 (Ha-112-II) driving a three-bladed propeller. This engine was borrowed from a Ki-46-III twin-engined reconnaissance aircraft. This engine was substantially lighter than the HA-45 that it replaced, and required that the engine mounts be lengthened in order to maintain the centre of gravity. In order to compensate for the additional length, the tail surfaces had to be enlarged. The Ki-116 weighted only 4850 pounds empty, a full 1000 pounds lighter than the standard Ki-84-Ia. The Ki-116 showed considerable promise and had a performance approximating that of the Ki-100. 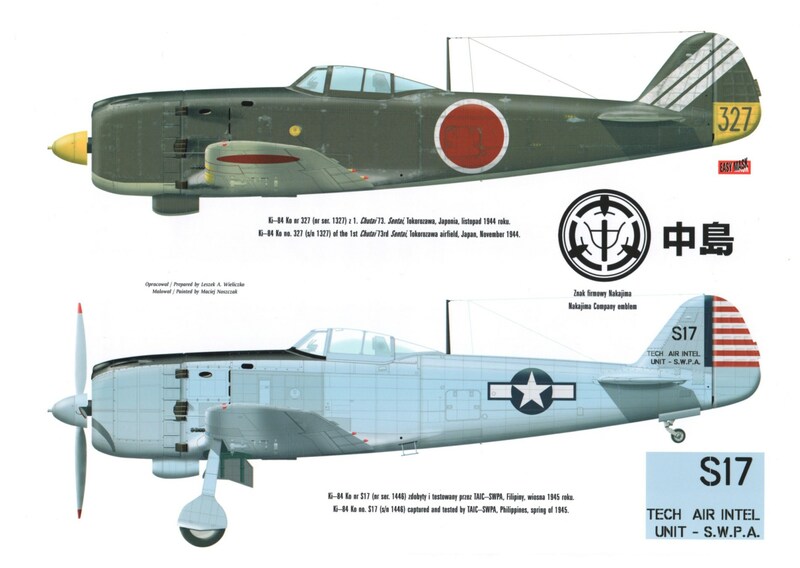 Test pilots were extremely enthusiastic about its capabilities, but the Japanese surrender brought an end to further development. Engine: One Army Type 4 fourteen-cylinder air-cooled radial (Mitsubishi Ha-33) rated at 1500 for take off, 1350 hp at 6560 feet and 1250 hp at 19,030 feet. Performance: Maximum speed 385 mph. Weights: 4938 pounds empty, 7039 pounds loaded. Dimensions: wingspan 36 feet 10 7/16 inches, height 11 feet 3 13/16 inches, wing area 226.04 square feet. Armament: Two fuselage mounted 12.7-mm Type 1 (Ho-103) machine guns and two wing-mounted 20-mm Ho-5 cannon. The Ki-84N was a projected high-altitude interceptor version of the Hayate powered by a 2500-hp eighteen-cylinder twin-row Nakajima [Ha-44] 13 (Ha-219) air cooled radial engine. The wing area was increased from 226 square feet to 249.19 square feet. The production version of the Ki-84N was assigned the Kitai number of Ki-117, and the aircraft was in the initial design stage when the war in the Pacific ended. The Ki-84P was another high-altitude interceptor version of the Hayate powered by the 2500-hp eighteen-cylinder twin-row Nakajima [Ha-44] 13 (Ha-219). 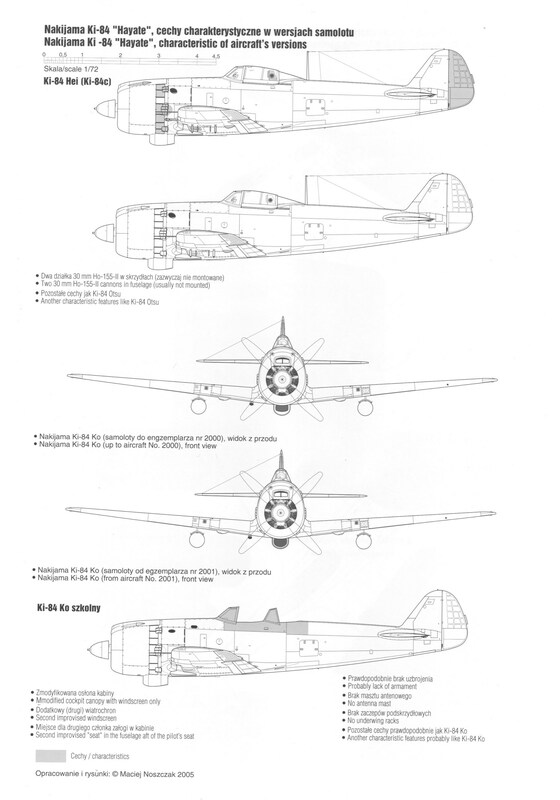 The Ki-84P differed from the Ki-84N in having the wing area further increased to 263.4 square feet. The Ki-84P was abandoned in favour of the less-ambitious Ki-84R. The Ki-84R was a projected high-altitude version of the Ki-84-I Hayate powered by a 2000 hp Nakajima [Ha-45] 44 with a mechanically-driven two-stage three-speed supercharger. At the time of the Japanese surrender, the first prototype was eighty percent complete.